Our local farmers market opened today and it was sheer heaven to be able to amble through stalls of unbelievably fresh fruits and vegetables, freshly baked goods along with artisan cheeses and organic meats. The flowers were absolutely gorgeous and I wanted to purchase every bouquet that was situated in the mason jars, but decided to wait for mine to flourish at Heath. 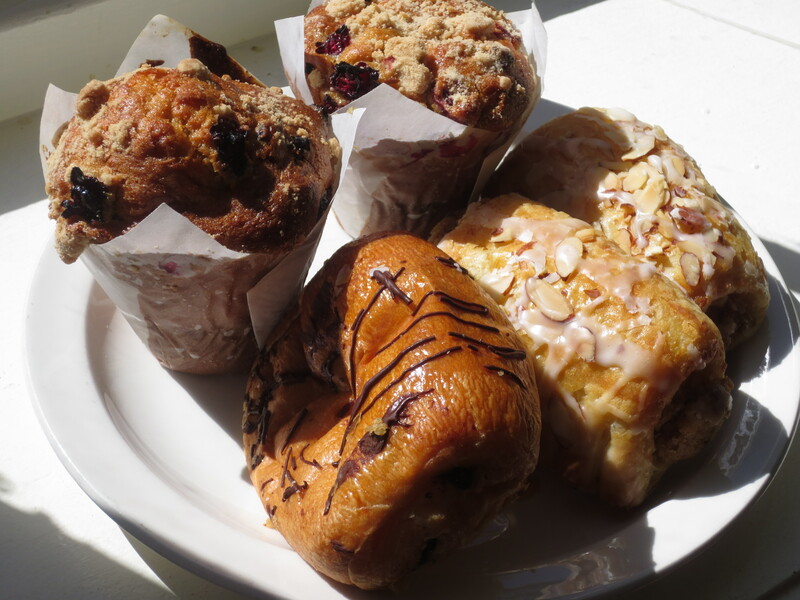 My first purchases were aromatically baked blueberry muffins with almond and chocolate croissants to serve with freshly brewed coffee for breakfast this morning. Next I was onto the “greens”, which consisted of a huge bunch of mustard greens, spring onions, leeks, asparagus and a few herbs; parsley, cilantro, thyme and rosemary. You could get 12 ears of sweet white corn for $2.00 and boy did I dive in for the kill. Steamed corn was definitely on the menu for lunch today. 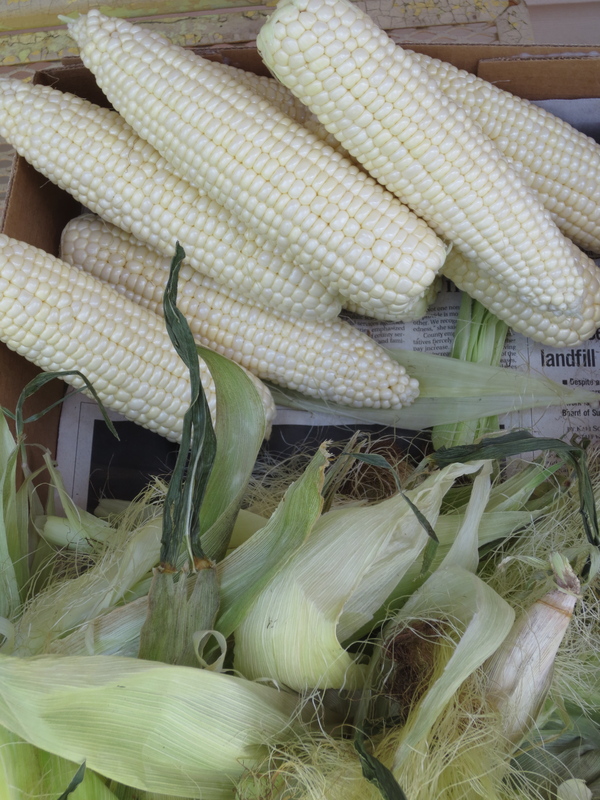 I absolutely love corn with no butter or salt, and to have a bit of room to saw into several ears without question. 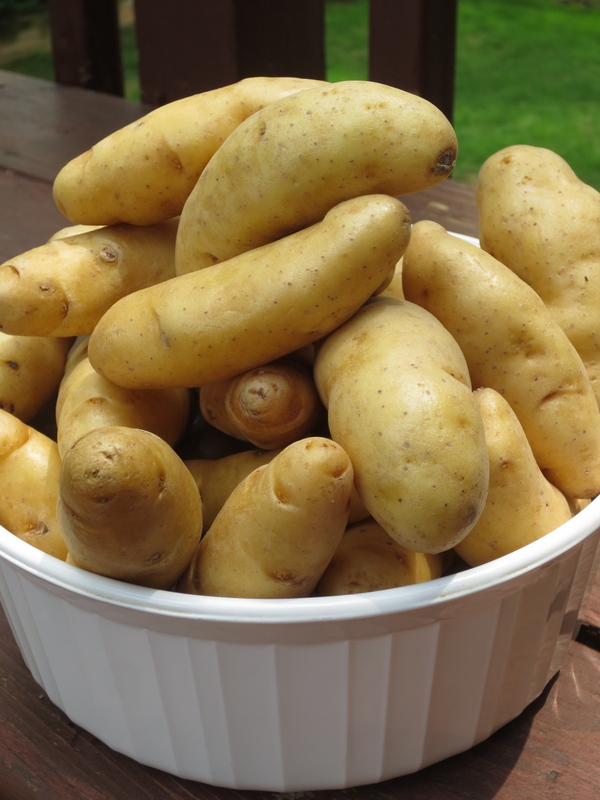 And last, but most certainly not least were the fingerling potatoes that would be perfect for Sunday’s menu. Several of my friends and I from work have been experimenting this past week with herb butters to keep for various evening meals. Cynthia our culinary expert shared her recipes for garlic and shallot herb butters and I cannot wait to try them on either steamed or pan-fried fingerling potatoes. In a mixer combine, a stick of butter, several tablespoons of garlic and about a ¼ cup of Parmesan cheese with a dash of kosher salt. I added a touch of Herbs de Provence and et voila…. herb butter. Portion the mixture into a log using plastic wrap and that which you do not use may be frozen. In the mixer combine, a stick of butter, 1 small shallot, minced, flat-leaf parsley, rosemary and kosher salt with crack black pepper. Blend and form into a log using plastic wrap. These flavored butters are great with crusty breads, on pan-fried steaks, potatoes or with fresh asparagus. The possibilities are endless!! come back from their school. These are delicious herb butter recipes, and will keep in the freezer to make a fabulous pasta dish, enhance the flavor of a steak or just to have with crusty bread and cheese on those nights when you do not want to cook. Enjoy!!! Hi Stylish Heath. I always liked the appeal of a Farmers’ Market. No frills. Just the food on display in an open environment. The food in your pics looks ready to bite into. Thanks for the recipes. Also, thanks for sharing your weekend trip to the Market with us. Always in style…………….Stylish Heath. It is always stylish to frequent the farmers market. I so enjoy the open environment of the stalls and delicious foods on display. I will definitely post about the markets throughout the season. Please have some these pastries and veggies and recipes ready to roll for Memorial day. Thank you. Consider it done!! Today I steamed the fingerling potatoes and then smashed them after cooling. Next, cooked them with garlic, onions and a bit of canola oil with butter. The potatoes were crispy and delicious side for dinner!! !